How to become fresh and youthful. This excerpt from our church bulletin explains why this date on the church calendar is a good one for someone to become a catechumen, as two people did on Sunday in my parish, and as I did seven years ago. It was not my first introduction to life in Christ, but it was definitely the time when I climbed up to the best vantage point to see Christ and His Church in all its fullness. 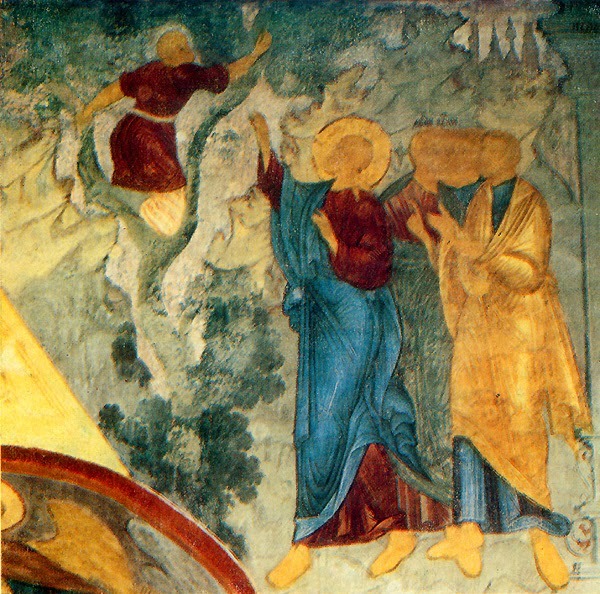 He climbed up in a sycamore tree for the Lord he wanted to see. Thus it was spoken by the One Whose word is life and joy and restoration of the righteous. Just as the bleak forest clothes itself into greenery and flowers from the breath of spring, so does every man, regardless of how arid and darkened by sin, become fresh and youthful from the nearness of Christ. For the nearness of Christ is as the nearness of some life-giving and fragrant balsam which restores health, increases life, give fragrance to the soul, to the thoughts and to the words of man. In other words, distance from Christ means decay and death and His nearness means salvation and life. Draw near to us O Lord, draw near and bring to us Your eternal salvation. Not a single place dark or unhappy. We have been ill around our house, and could not get going on the Christmas tree project until this week. Now we managed to get it up and decorated. I cut off our homemade wood-shaving angel in the picture so I’m showing a close-up in the next. 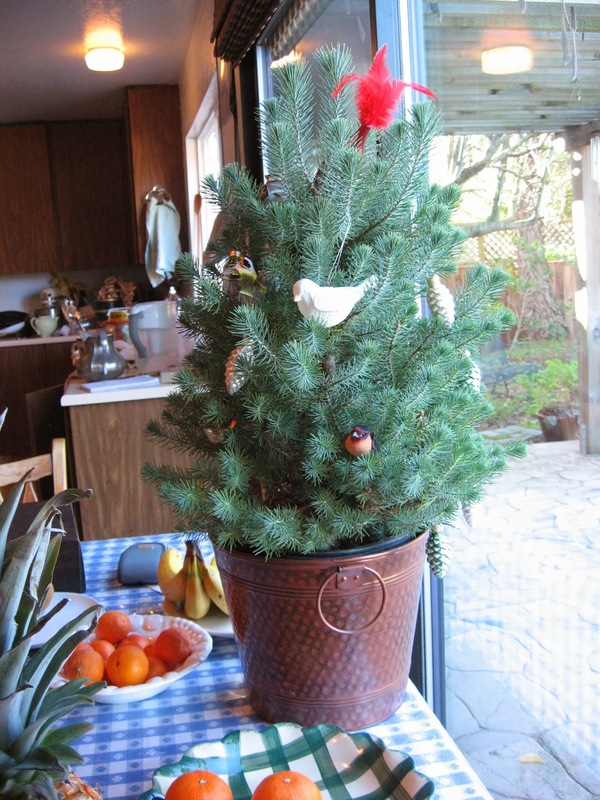 Mr. Glad did nearly all the tree-trimming this time, after he went all by himself to get the tree, a Noble Fir grown in Oregon. Anna wrote last week about various Advent and Christmas trees she has known, and it made me want to remember some trees of the past. Her post includes a photograph of a large and dramatic Christmas tree in Norway. 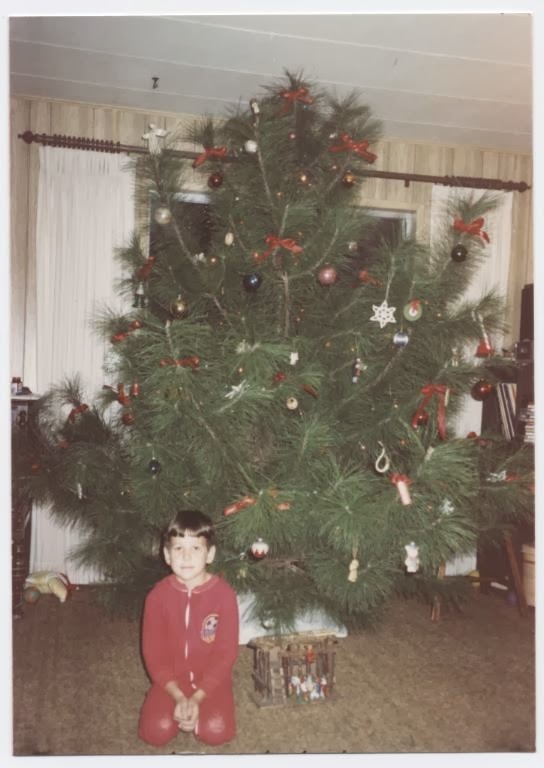 I don’t have anything that old, but at right is a picture of me in a red sweater in front of a 1950’s tree. And at the bottom of the page, a little tree that the sister in the photograph gave me more recently. 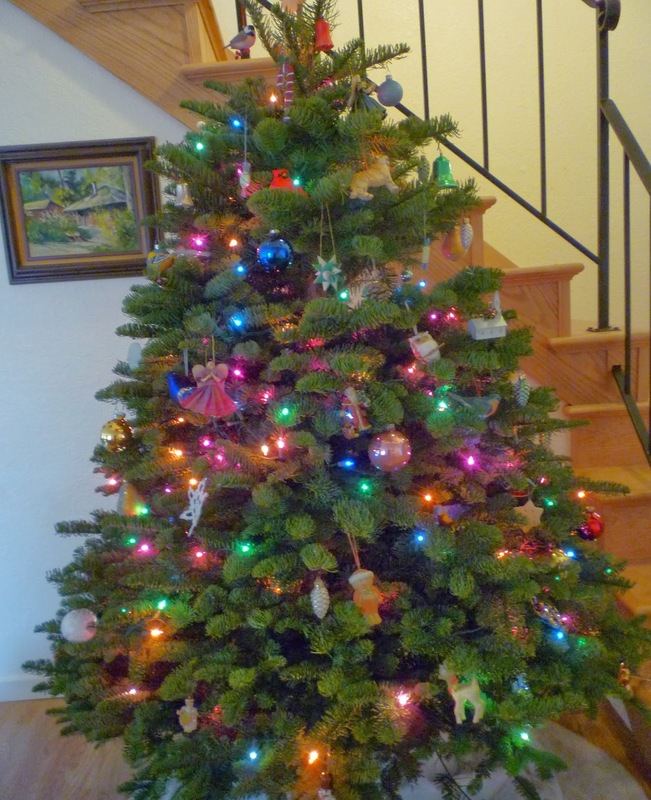 I like best to have birds and fruit and pine cones on my tree, and I never did like tinsel. 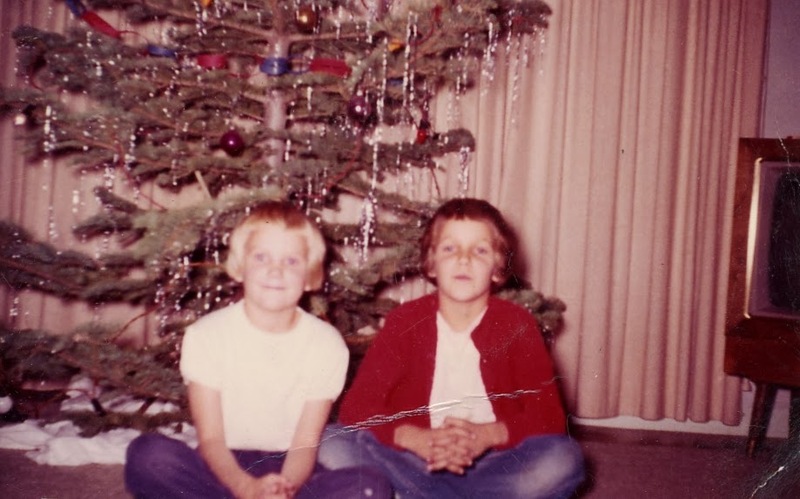 The boy at left (now our Soldier) is posing by a tree from a minimalist era, when a friend let us cut from his property a wild and untamed specimen, on which we don’t appear to have strung lights. 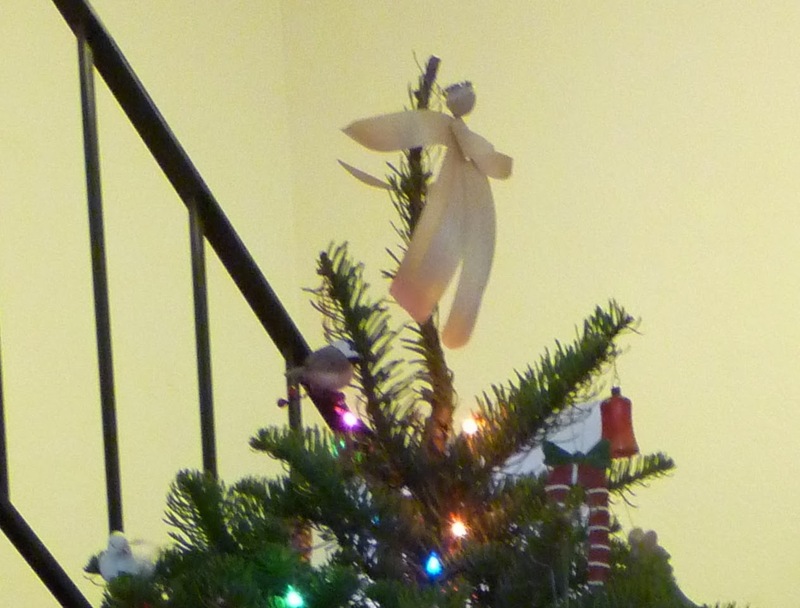 But how strange and exciting for young children to have a tree in the house for a while, even undecorated. 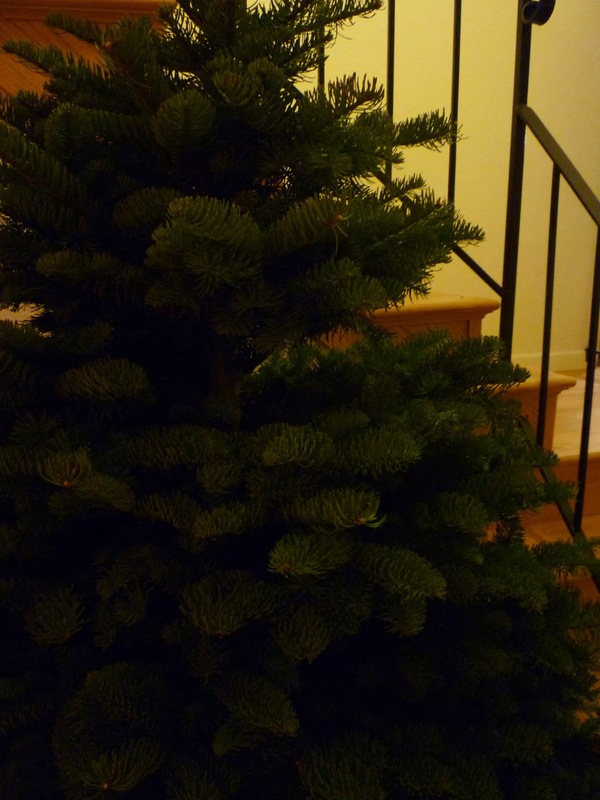 Below, this year’s tree before trimming, to go with a sweet poem e.e. cummings wrote. 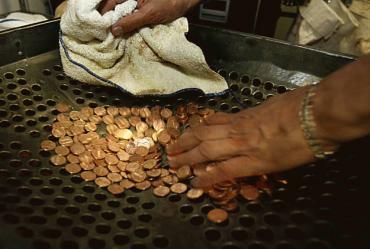 My grandmother had grown up on a farm where she was probably comfortable with animals and “good clean dirt.” But when we knew her she had lived in the city for a long time (not The City of San Francisco, though) and was comfortable with us washing our hands quite frequently, especially if we had handled “dirty money,” i.e., all money. She wore gloves quite a bit, for different purposes. It’s very easy for me to pull up the image of her holding her soft leather driving gloves that she had just removed, which kept the fragrance of her warm and soft hands. When my sisters and I visited her from our farm in the Central Valley she would take us across The Bay Bridge to The City. We dressed up in our finest and made a day of it, though I have no memory of just what we did there. Today I was made to wonder if she took us to the Saint Francis Hotel for lunch, because she would have liked the fact that they keep their money clean. As a proper housewife I appreciate the use of soap and water and the impulse to keep things fresh and sanitary for the health of my family. Probably even the saint for whom the hotel is named wouldn’t have turned down a gift of soap. Or money, whether clean or dirty.